I’ll never forget where I was the day I heard Lady Gaga crow for the first time. Not the singer, but my chicken, a particularly beautiful little guy with flashy feathers and a gorgeous, larger-than-life swagger. To backtrack: I never asked for Lady Gaga the day we ordered 50 baby chicks from our local feed mill. In fact, I never order roosters for our farm’s small pastured-egg operation (but inevitably always get a few). Still, I recognized something so dainty and feminine in Lady Gaga as I watched the chicken grow. Unlike most other hens on our farm, this one featured poofy feathers that flowed like a reverse waterfall atop its head. With long, showy feathers covering “her” toes and such ornate plumage, this chicken looked like it was wearing a wild, flamboyant costume—hence the name, Lady Gaga. We weren’t even thinking gender when we named Gaga. This chicken was so pretty, there’s no way it was a guy! Except one morning, as we were out in the field gathering vegetables for our CSA customers at Potter’s Farm, we heard the most awful, pathetic, screeching noise near the chicken coop. It made us cringe. It was like nails scraping down a chalkboard. It was…it was Lady Gaga crowing?!?! From that moment on, Gaga’s demeanor changed. Although a tiny bantam-type rooster—quite literally a featherweight, perhaps some sort of cross between Polish and Silkie breeds (or a Sultan)—he took his role as rooster, protector of his hens, very seriously. 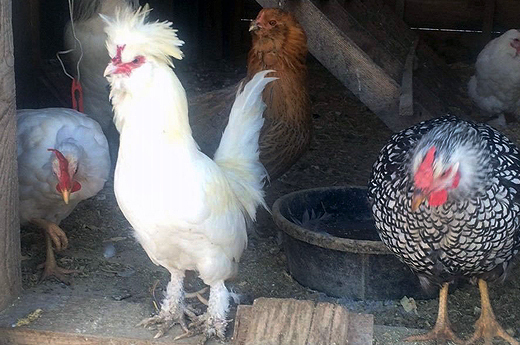 Although we had several other, much larger roosters in the flock, Gaga always seemed the most stoic. He was the one who ventured to the outer perimeters of the pasture to keep watch. If he saw a hovering red-tailed hawk or sensed a predator in the area, he’d reach into his toolbox of rooster sounds, alerting the ladies to take shelter while he continued to hold watch by the edge of the fence. Gaga was very intelligent, too. Whatever he lacked in stature, he made it up with smarts. 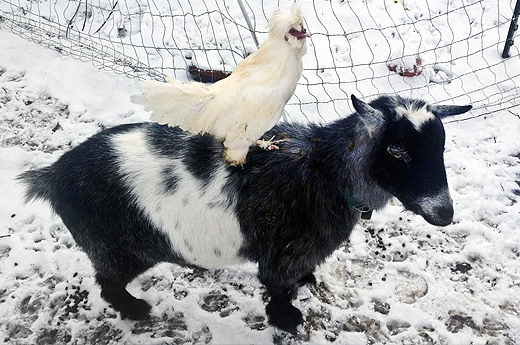 That was never more evident than the Christmas morning my husband and I looked out the window to admire the fresh snow, only to see Lady Gaga riding the perimeter of the chicken coop…atop our goat, Stanley! He knew how to police the area, protect his ladies, and stay warm. During the last polar vortex, I’d open the coop in the morning and see him watching over his flock, sometimes sandwiched between hay bales to stay warm. I’d tend to the chores with the little guy in my sweatshirt, feeling much like a mom walking around with a baby sling. He seemed to appreciate the few minutes of extra warmth, but was always eager to hop out to keep an eye on his girls. As our frigid, snowy Pennsylvania winter raged on, the snow and ice had accumulated so high it nearly reached the top of our portable fence. The electric zaps that usually pulsed through the fencing were failing, but we hadn’t had predator problems in the five years I’d been raising chickens, so I opted to still let the chickens outside for fresh air. They were used to it—being “cooped up” wasn’t something our chickens enjoy. Besides, it was a rare gorgeous day during this tough, freezing winter, and I wanted them to be happy outside. As I approached the coop at sunset to close the door and secure them all in for the night, I knew something was off. To the right of the coop I spotted a pile of feathers, a leghorn that was the unlucky target of our first fox attack. To the right, I spotted another victim, but it was getting dark quickly and I couldn’t ID the second perished chicken. I scanned the inside of the coop, looking for Lady Gaga’s usual spot. He was nowhere to be found. I felt a pang in my gut. Of course, I love all of my chickens, but Gaga was special. And he brought so much happiness to so many Potter’s Farm visitors. I went back to the crime scene and hunched down to investigate. The victim had five toes, a characteristic of silkies and a few other breeds. It was Lady Gaga. I’m no forensics expert, but if I had to reenact the crime scene, I’d say Lady Gaga jumped out of the coop as the hen was being attacked, trying desperately to save her, but probably well aware he was no match for a fox. The fox quickly, and probably pretty painlessly, killed Lady Gaga, who likely interrupted his feeding on the hen. The hen and Gaga’s bodies lay motionless less than two feet apart. In the morning, I buried him in the snow about 50 yards from the coop, under a fallen tree, beside his fallen hen. I thanked Gaga and the hen for all of their hard work over the last two years. I wished they could have made it to feel the warm spring sun on their backs after such a long, hard winter. Rest in peace, Lady Gaga. Additional Note: One of the reasons I’ve always allowed roosters to live on the farm involves the way they are generally treated in industrial farming. According to animal welfare investigations, many roosters are born into this world and die on the same day—they aren’t seen as valuable because they don’t lay eggs and take too long to grow fat enough to sell for meat. Hours-old baby chick roosters are often cruelly ground up alive, tossed into a grating machine, because they don’t fit into the factory farm system’s plan for profit. But roosters do serve many purposes. They play an important social role in the flock hierarchy, according to My Pet Chicken Handbook. And, as we saw in the case of Lady Gaga, they help protect the flock, and will often go down fighting, sometimes even sacrificing themselves for their hens. I’ve been told by more than a few people that I’m “not tough enough to farm” because I develop real relationships and love for my animals. I take death harder than others, but also know that, despite our mistakes, we give our chickens the best lives we can. And they give us a lot, too. Many laughs, free security for the flock, and perhaps the best lessons of all—the reminder that every day is a gift, and even when it comes too soon, death is part of the package deal—something not you, I, or even the bravest rooster in the world can escape. Rest in peace, Lady Gaga! You’re gone but not forgotten! You have brought me to tears. My condolence Leah. Keep being sensitive and loving to your animals, that’s how it should be. Cruelty is never necessary when dealing with defenseless animals, or animals period! He was beautiful. Oh Leah! I’m so sorry for your loss!! Your love for your animals is what makes you an amazing caretaker for them. It’s hard on the heart, but a gift to them and to everyone who you teach and share your stories with. Rest in peace, Lady Gaga. Thank you Leah, for the compliment and being the lovely soul that you are. Thank you for sharing this touching story with the rest of us. I am always amazed at how many of the Rodale family of workers are just so loving, kind, caring human beings. And how they can all write about daily life in such a touching way that it brings me to tears, both happy and sad tears. Makes me think Maria has the very best employees in the world, and the most loving and gifted!! If I weren’t so completely happy being retired, I think I’d try to get hired on at Rodale myself, just to be in their company daily! Thank you, Leah, and also thanks Lady Gaga! Thanks, Alice. Those were such nice things to say. Rodale is a great place to work. Thanks for reading! I totally understand the joy of raising, and the sorrow of losing chickens. They have become our unlikely favorite “pets”. I have one hen that is disabled now and can barely walk, but not in pain. I hand-feed her daily, as she is such a fighter and wants to go on. 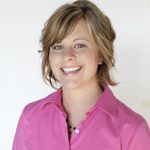 I guess someone else might take her back behind the barn and just shoot her because she can’t contribute much anymore. We’ve lost 2 so far to old age, and it is always rough. People have no idea how smart, sweet, and entertaining chickens can be – and there is nothing better than collecting a fresh egg. So sorry to hear about Lady Gaga’s passing. He definitely was a pretty boy! I still have his picture on my phone and show him often to others. Gallant and chivalrous to the end, RIP. Lady Gaga. I’m just really glad that I got to meet Lady Gaga. I’m also glad I got to have a photo shoot with him. Great day, great rooster! Ah! I should have included the photo shoot pics, Cody! I didn’t even think of that! A tiny, brave rooster sent from God 🙂 I pray for the day when factory farming and animal cruelty is eradicated. Poor Lady Gaga! I know how it feels to lose a favorite rooster or chicken… they always seem to get the best ones first, too! The only solace I have in losing one to a fox is knowing they just need to feed their babies, though I guess this early it was probably a pregnant mama fox – or a mink – not sure if you have those critters where you are. Thanks for sharing Leah- Jeroen and I are about to embark on our first chicken adventure ( four laying hens) and I had thought I would forgo having a rooster. You have changed my mind. Sounds like Gaga died like he lived. I was right there with you throughout your story of Gaga. We had a Silky mix fellow once with a group of Aracana and other full size hens. He tried to manage his group. taking over for a big red rooster who had been killed by dogs that climbed our back fence. The girls, still being in love with the poor dead guy wanted nothing to do with Mr. Silk. The more he pushed the meaner they got and the origins of the term “henpecked” became perfectly clear to me. He was so hen pecked one day that I think they forced him to commit suicide in the horse water bucket. I found him dead and floating one afternoon. It was a small wooden barrel he could have hooked a toe over the edge and climbed out of I think, so we always assumed he did himself in. Sad situation in any case. Thank you for your share. I too have always found the individual in every animal I have ever crossed paths with. If only people could realize that every chicken has an individual personality, likes, dislikes, opinions and companionship to share, maybe a lot less chicken wings would be consumed. We have had “Lady Gaga”, a diminutive Silkie hen, in our little flock the past 3 years. Like your Gaga, she has a strong personality and high intelligence. Sorry for your loss.